Veracross is a robust and comprehensive school information system. While new to CWA, Veracross has served clients’ digital database needs for 15 years and works exclusively with schools, specializing in the kind of online tools that make the lives of teachers, staff, students, and parents and guardians much easier. This new SIS will allow Tarriers to consolidate the number of digital locations for school information into one platform for news, events, calendars, grades, attendance, class schedules, directories, student billing, and more. All of this information will be available behind a user login, and all content will be secure. Information will live in one (or more) of three places: a teacher portal, a student portal, and a parent and guardian portal. If you have any questions about your Veracross account or how to find information in the system, please send an email to veracross@charleswright.org. Where is my Veracross welcome email? Initial Veracross welcome emails were sent to parents and guardians on August 28, 2017, and to students on August 29, 2017. The links included within them have now expired. However, the system has a built-in solution to that particular problem. If you are able to find your original welcome email, and you click the link within, you will likely get a message about said expiration. The system will immediately send you another welcome email the moment you click that link. So, if you return to your email, you should see a new welcome email that will allow you to set up your account with no errors. If you never received a welcome email, there could be a number of reasons. To best help us troubleshoot that with you, please use your primary email account (the one you want to associate with your Veracross profile) and send a message to veracross@charleswright.org, letting us know that you need assistance setting up your account. Where do I log in to the parent/student/faculty/employee portal? You can log in to any of the four CWA porals in Veracross by visiting https://portals.veracross.com/cwa. If you are a teacher at the school who also is a parent or guardian of a current student, your default portal will be the faculty portal. 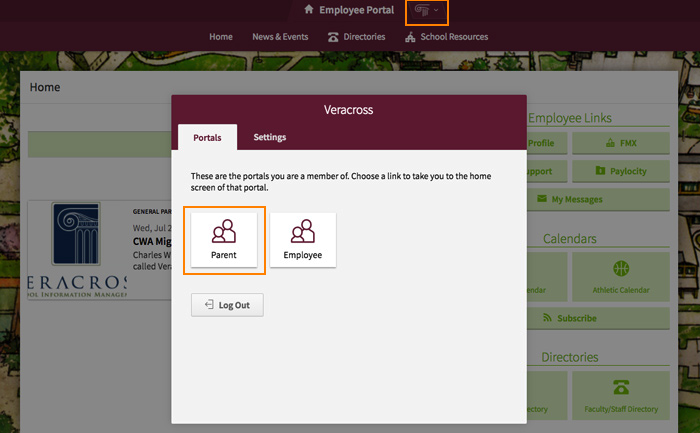 You can toggle to the parent portal or to the employee portal by clicking on the Veracross icon at the top of your home screen and clicking on the desired portal icon that appears in the pop-up window. 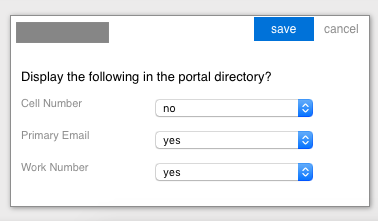 If you are a staff member at the school who is also a parent or guardian of a current student, your default portal will be the employee portal. 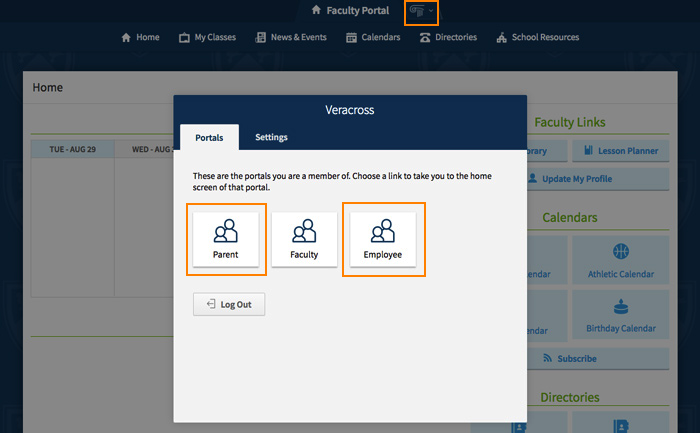 You can toggle to the parent portal by clicking on the Veracross icon at the top of your home screen and clicking on the parent portal icon that appears in the pop-up window. How do I subscribe to the right calendars? While there are a lot of different calendar views, most families really will need to subscribe to just a few, depending on how much you want to see. First, log into the parent portal, scan the buttons on the right-hand side of your browser window, and click on “subscribe” in order to access your own household calendar. 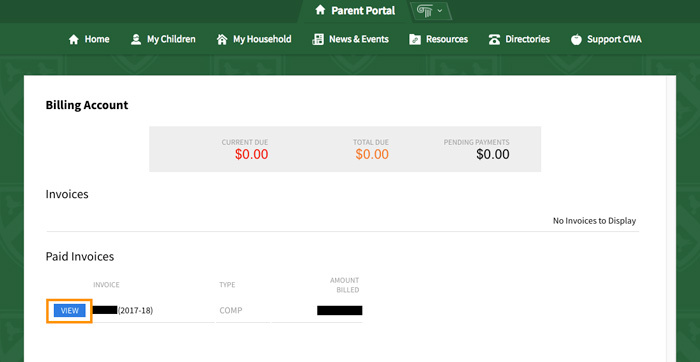 This will bring in all major dates (vacations, days off, parent-teacher conferences, big holidays, or all-school events), plus any other events that are relevant to your family based on how you are classified in the system. Families with children in the Lower School, for example, will automatically see Lower School events. Read the instructions carefully to do what works for your personal calendaring platform. Below that you will see calendars specific to your child’s scheduled classes and assignments. We do not recommend that you subscribe to these as they will bring in a LOT of detailed events that are best viewed within the parent portal itself. Next down the page are the Athletic Calendars. The sports you see in the list are only those which your kids have signed up to participate in, so it’s easy to subscribe to their sports only. 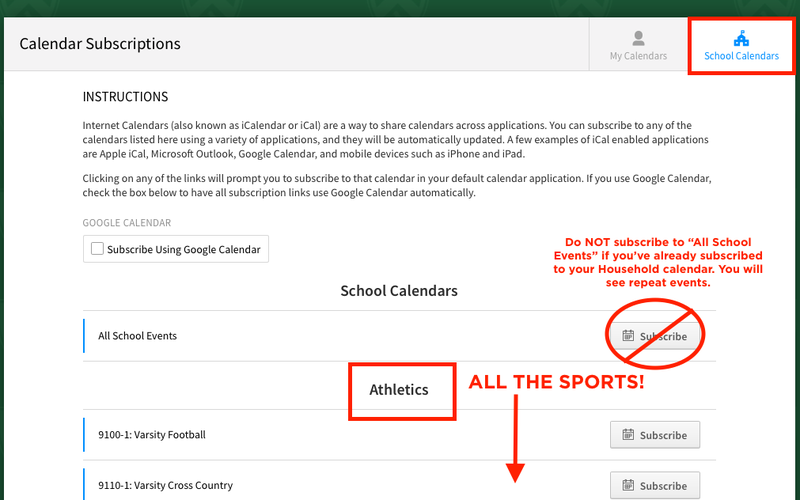 IF, however, you would like to subscribe to other athletic calendars, you can switch the tab at the top from “My Calendars” to “School Calendars” and select the sports you wish. Do NOT subscribe to “All School Events” if you’ve already subscribed to your household calendar. Keep in mind that you can always check the school calendars in the Parent Portal, to see what else might be happening in other divisions, but anything we have tagged “All School” will show up in your household calendar. You shouldn’t miss anything! How do the CWA directories work in Veracross? TYPES: Currently, the default directories available in Veracross are the students (all or “by grade level”), households, and faculty/staff (all or “by school level”). Student directory: every entry within the directory is fundamentally a student. Household directory: every entry is a household, including adults and children. Faculty/staff directory: every entry is a single person, faculty or staff. CWA no longer prints a paper directory, as it is usually out of date the moment it goes to press. Whereas all directory changes once went through the Admissions office, families can now update their directory information themselves whenever a change occurs. 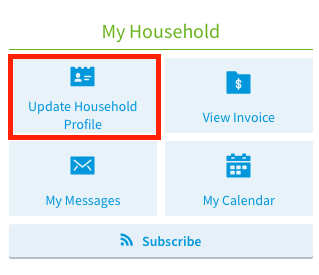 This happens through what Veracross calls the Household Profile Update (HPU). YOUR HPU: The information initially in your HPU is what migrated from our old database system. In the welcome email families received, there was some information about how to update your HPU immediately, or verify that the information we have is correct. Many of you have already submitted updates and changes, thank you! There are more detailed directions for making updates to your HPU in another section. 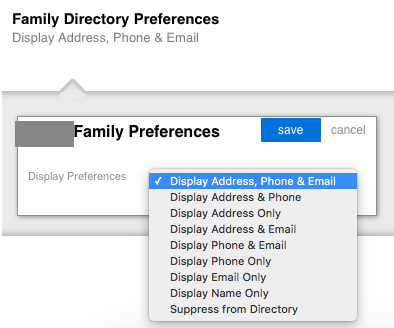 Click the Family Directory Preferences in the HPU, then click “edit” to see the options of what you’d like to make visible to others. Please note that because families can individually select their own privacy options, you may not be able to find information you are looking for automatically. It is our school policy to respect the privacy of our families, so we will not provide this information to people seeking it for other types of communication. If you need to reach certain groups at school, that communication should come from an employee with access to the system. How do I update my address(es) or phone number(s)? Address and phone number(s) live in the first section of the HPU under “FAMILY INFORMATION.” Verify your address or “change primary address” here. If it looks good as is, you’re done! How do I add people whom I want to receive school communication, be listed as emergency contacts for my children, or have the right to pick up my children from school to my household? 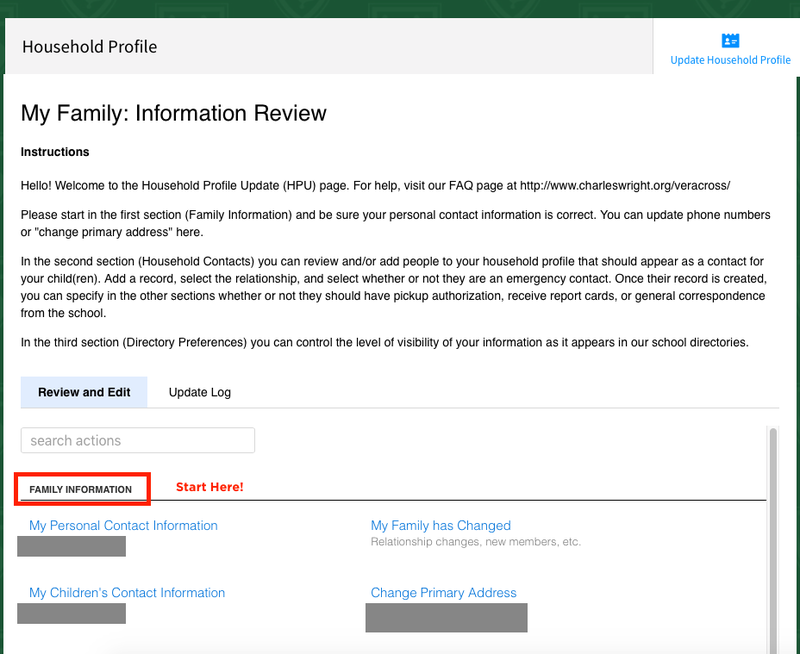 In the second section under “Household Contacts” click “Contacts for My Children” to review the existing records and/or to add a new one. If you wish for someone new to appear as a contact for your child(ren), you can add a record, select the relationship, and whether or not they are an emergency contact. Once you do this, you can then visit the other sections of the HPU to clarify which contacts should have pickup authorization, receive general correspondence, and receive report cards. How do I view my monthly billing statement? 1) Log in to the Parent Portal. 3) For a detailed view of your invoice, please click on the blue “View” button. 4) If you wish to print a PDF of your invoice, please click “Print to PDF” in the upper right-hand corner of the page. How do I pay student billing? Select the option of credit card, debit card, or ACH/echeck. A 2.5% fee will apply to credit card payments (Visa, Mastercard, American Express, Discover). A .95% fee will apply to debit card payments (Mastercard, Discover). No fees apply when paying by ACH or echeck. There is no preferred payment method. 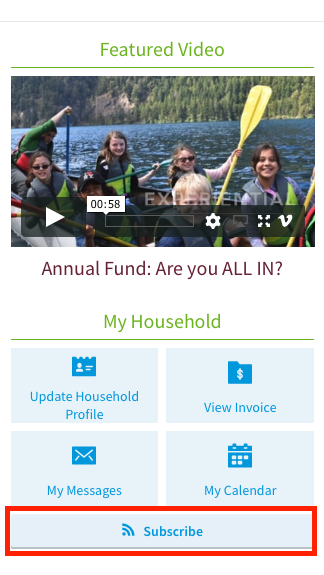 If you have any questions about your billing statement, please contact Karin at kmattson@charleswright.org or 253-620-8383.